For over 25 years Pine Lake, near Gonvick, Minn., has been the scene for the start of cross-country snowmobile racing and 2013 will continue that tradition. Racers look to shake off the summer rust, find their favorite line, and get their pace back from last season. New machines go from crate to workbench to the fast ice surface of Pine Lake where clutching, jetting, and setups are tested in preparation for the new season. The Pine Lake 200, once again, kicks-off a highly anticipated, eight race USXC schedule for 2013-2014. Mother Nature delivered an early present to northwestern Minnesota with over a foot of snow in some areas this past week. The fresh white stuff was also preceded by timely temperatures for ice making. While the snow isn’t as important as the cold temps for Pine Lake, the racers will take all the snow they can get. At this point in the year seat-time is vital, so the early winter weather is welcome by all. The course at Pine Lake will be a serpentine lemans style layout with lefts, rights, and traditional fast straights to blow out the carbon. The Pine Lake course is generally free from the hard-core, big-bump terrain prevalent later in the season, but always demands heads-up, technical driving ability. Taking advantage of the fast sections and keeping the rubber side down in the corners is a good recipe for success. With the history of past Pine Lake winners like USXC’s Brian Nelson, Kirk Hibbert, and Bryan Dyrdahl in mind, 2012-2013 Pro 600 champ Ryan Simons will look to lead off with a strong start to the season. 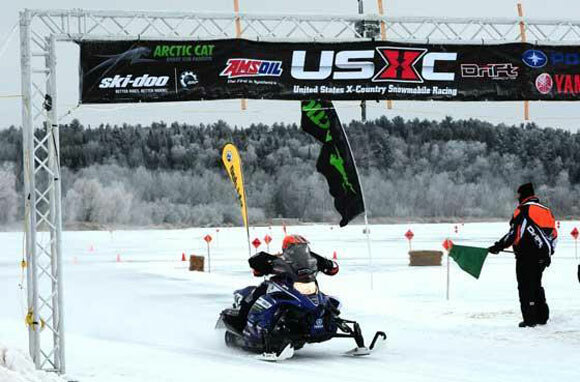 Simons, aboard his Arctic Cat Sno Pro, won both the Drift Racing Pro and Speedwerx Pro Open classes last year. Other pro riders to watch include Ross Erdman, returning to a Ski-Doo factory ride for 2014; Team Yamaha steps up their game, adding Corey Davidson and Matt Piche, another snocross convert, to their effort; and the Bunke Racing Polaris crew always manages a strong showing. The USXC Racing Gerald Dyrdahl Memorial Pine Lake 200 should be the start of another exciting season in cross country snowmobile racing on Dec. 14-15.